$779,000 $1.09 per square meter! Address: 180 Acres (73 hectares), 1Kilometer from the beach, $1.09 per m2!!!! Near the famous Drake Bay Eco tourism destination that is a fabulous place to watch humpback whales migrate and mate during certain seasons. 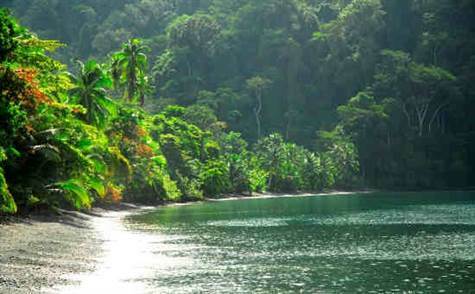 This area is surrounded by sparkling Pacific waters and lush rainforest, with lush jungle and tropical wild life. Carate is one of the Osa Peninsula's most secluded wonders, with healing properties and fresh oxiginated air. The property is located two miles south of Corcovado National Park's La Leona Ranger Station, this nature-lovers paradise is known for its undeveloped beaches, biodiversity, and outdoor adventures. The property has accessible roads, and its own source of water. It also comes with a rancho and a small house that is currently being used as a caretakers home. There are two regional airports nearby: Puerto Jimenez and Drake Bay airports, so you can access the property with a short 1 hour flight from San Jose, and then a short drive. From Puerto Jimenez it's about 1.5 hours. There is also an air strip 5 minutes away so you can fly directly into Carate.